Its not secret that I am a big fan of Evernote. For those that don’t know what it is, Evernote is a note taking app that syncs across all your mobile devices and computers while making everything searchable. It even incorporates traditional paper note taking and is able to bring it in to your electronic world. Don’t worry about losing your paper list with everyone’s gift ideas on it. not only would it be hard to remember what you are getting everyone, but leaving it lying around may come under the scrutiny of those who’s names are on the list. On the topic of using your camera phone for gift ideas, another tool you can use this holiday season is Social Media. Pinterest is a newer social media platform that has gained quite a bit of attraction since its launch. Its purpose it to share images on a board, much like a bulletin board. Once you log on, you can create a board where you can scour the internet for pictures of gift ideas, or use your camera to take pictures while out shopping. This is great for making your preliminary list of things to get people, as well as making your own holiday wish list. You can share your list or keep it private. (Just know that once you make a private board public you can’t undo it). Pinterest is also great for finding lots of holiday decorating ideas. The holidays can be a stressful time, but hopefully if you start early, and use your connected technology properly, you can get through it quickly and stress free. Tech Tip: Your Tablet and laptop can be great companions in the kitchen. Google recipes and clip the good ones in your notes application. It seems rather fitting that we look at the use of technology in the kitchen today, being the American Thanksgiving and only a few short weeks away from family dinners around the holidays. Laptops, tablets and smartphones all can provide a great deal of assistance during the dinner hours. Deciding what to make can be daunting as it is. I have spent many evenings looking at the freezer and seeing what meats we have, only to get stuck on finding what would be the best way to prepare them. This is where Google has been a great help to me. A simple request asking for recipes for *Insert main food ingredient here* and I have a plethora of ideas from the simple to the gourmet available to me. I find Chicken and Pork are the two meats that are staples in our house, but need to be changed up so as not to create the same boring meal every time. Chicken recipes are plentiful on the Internet. I’ve found many of my favourite recipes at allrecipes.combut it is by far not the only place to look. That’s where Google comes in. By entering what you want to cook, you will get a list of different sites and recipes. What to do when you found your perfect recipe? Once you have your dinner prepped, depending what your cooking, you may need to time how long it takes to cook something. Most clocks on smartphones now will have both a countdown and a count up timer. Set your alarm for however long you need and walk away. (Don’t forget to check in now and then on your food though!) Enjoy your company and not worry about missing the alarm on the oven, since you will probably have your phone with you. Now that dinner is cooked, use your smartphone to run some nice music through a pair of speakers. You can find a pair of cheap, wired speakers almost anywhere for a few dollars, or splurge and go for a set of Bluetooth speakers. iPhones are obvious choices for listening to music, but I actually use a music server called Subsonic. It allows me to store all my music in one place and access it from any phone, computer or tablet I want through either an App or a web interface. So relax to some smooth jazz music, or blast out some Holiday cheer, whatever strikes your fancy when the family all shows up. Hopefully these tips will help make your meal preparations go smoothly, and help change up the variety of foods and meals. 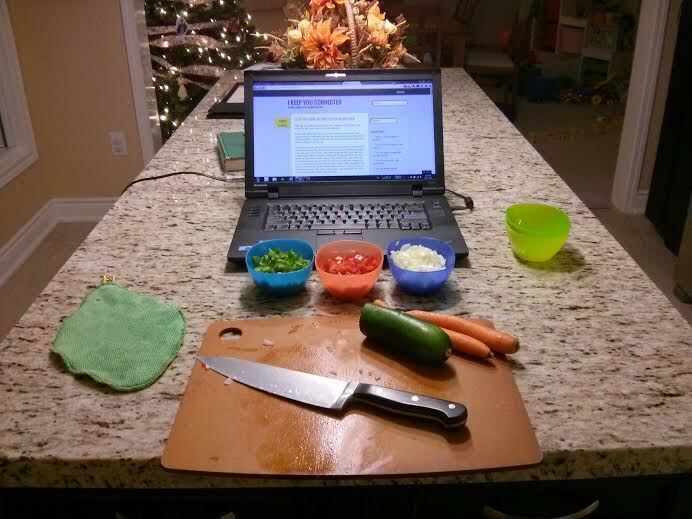 I can help you with the technology, but cooking skills…..you’re on your own!